Borussia Dortmund could have taken one major step toward claiming this year’s Bundesliga crown when they went to Munich for Der Klassiker. But instead, they were utterly blitzed by Bayern in a 5-0 demolition which saw them slip back down to second in the table. 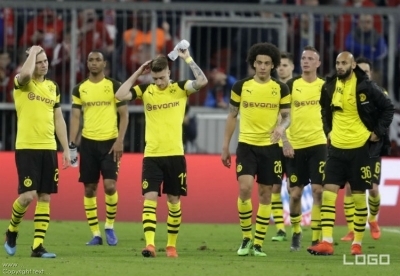 That crushing defeat may have dealt a big blow to Dortmund’s Bundesliga 2019 betting odds to win the title, but the race isn’t completely over just yet. There are still six matches left in the season, and another twist could be just around the corner. However, Dortmund must bounce back and put their demoralising defeat at Bayern behind them. That begins when they host Mainz, who essentially have nothing left to play for this season, which makes them an ideal opponent for Dortmund. Dortmund’s trip to the Allianz was an utter disaster; there’s no two ways about it. The game was basically over after Robert Lewandowski scored the second goal, and the 4-0 scoreline at half-time was simply humiliating. Dortmund captain Marco Reus was understandably frustrated by their “catastrophic” defeat to their main title rivals. But he must now look to rally his team together following their major setback. Dortmund still have a shot to win the title if Bayern suffer another slip-up, but they need to keep applying the pressure on the leaders. Manager Lucien Favre also needs to play a major part in getting his young side’s shattered confidence back up. The defence, in particular, needs to regroup following last weekend’s debacle. The good news for Dortmund is that they likely won’t need to do too much defending against a Mainz side that’s not exactly known for taking the fight to their opponents. On the other side, the Dortmund attack will need to get back on track after getting just four shots up against Bayern. Dortmund will be hoping that top scorer Paco Alcacer, who missed the Bayern match due to an arm injury, can finally return to the squad and provide a spark. The Spanish striker, who was last seen scoring two late goals in a win against Wolfsburg, also came off the bench to score in Dortmund’s 2-1 win over Mainz back in November. Going back home should also do the Dortmund attack a world of good. They are undefeated at Signal Iduna Park this Bundesliga season (12 wins, 2 draws) and have scored at least two goals in all 14 of those games. Mainz are just waiting for their season to be over. They are currently in 12th in the table, 12 points clear of the relegation zone. With safety all but secure, they essentially nothing have left to play for. Their lack of motivation has been evident in recent results. They’ve lost seven of their last nine Bundesliga matches. Although, they are coming off their biggest win of the season with a 5-0 demolition of Freiburg. Jean-Philippe Mateta fired home a hat-trick as he raised his tally to 10 goals this season. However, that win came at home, where Mainz’s Bundesliga 2019 results have been respectable. Away from home, though, it’s been a completely different story. Mainz have lost nine of their 14 Bundesliga matches away from home this season while scoring a mere 12 goals. They’ve dropped their last five away matches in a row, finding the back of the net just twice in those games. And like Dortmund, Mainz were also on the receiving end of a walloping by Bayern Munich as they got crushed 6-0 at the Allianz last month. Unsurprisingly, the recent head-to-head record between Dortmund and Mainz has been pretty one-sided. Dortmund have won 13 of their last 17 meetings in the Bundesliga, with two draws and two Mainz wins. However, one of Mainz’s two wins over Dortmund at Signal Iduna Park came just last season. Prior to that loss, though, Dortmund had won each of their last five home matches against Mainz. Dortmund likely couldn’t have asked for a better match to help them regroup from the Bayern blowout than Mainz. With the recent history between the two clubs as well as Mainz’s horrendous away form, it’s all set up for Dortmund to deliver a morale-boosting win in front of their home fans. SBOBET odds have Dortmund at -1.75 on the Asian handicap market priced at 2.13. But with the home side looking to exorcise the demons of last week, there’s a good chance they win by a much more comfortable margin.